Pyomyositis is a primary bacterial infection of striated muscles nearly always caused by Staphylococcus aureus. Development of the intramuscular abscess involving the extra-ocular muscles (EOMs) remains an extremely rare process. 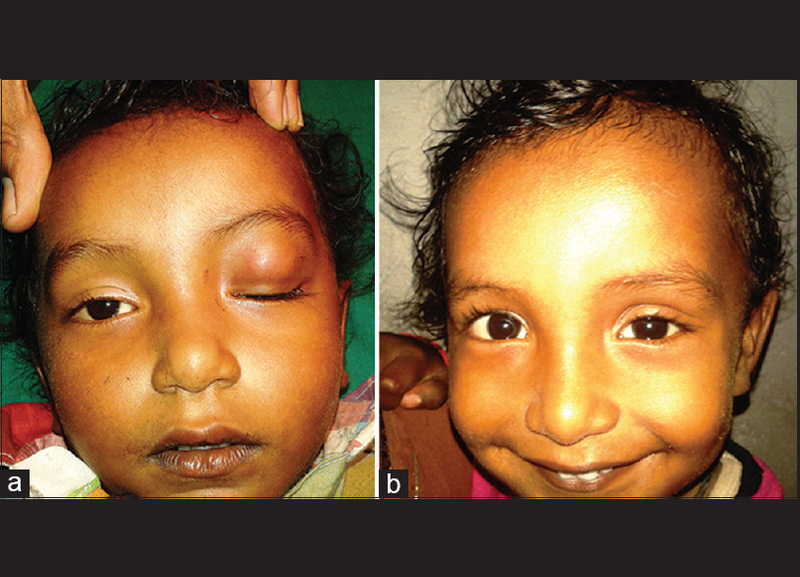 We herein present a case of isolated EOM pyomyositis involving superior rectus muscle in a 2-year male child who was referred with complaints of swelling in left eye (LE) and inability to open LE since last 1-month. Orbital computed tomography (CT) scan showed a well-defined, hypo-dense, peripheral rim-enhancing lesion in relation to left superior rectus muscle suggestive of left superior rectus abscess. The abscess was drained through skin approach. 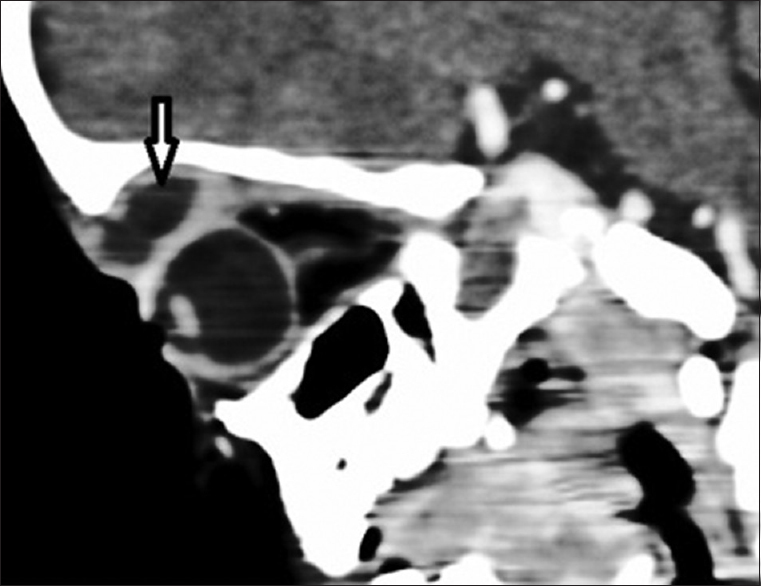 We concluded that pyomyositis of EOM should be considered in any patient presenting with acute onset of orbital inflammation and characteristic CT or magnetic resonance imaging features. Management consists of incision and drainage coupled with antibiotic therapy. An idiopathic muscle abscess is a rare condition that should be considered in the differential diagnosis of painful limitations of eye movements and double vision in children. We herein present a case of isolated EOM pyomyositis involving superior rectus muscle in a 2-year-old male child. A 2-year-old male child was referred to our hospital with complaints of swelling in left eye (LE) and inability to open LE since last 1-month [Figure 1]a. There was a history of fever since 1-month. On examination, there was a tender, palpable, ill-defined mass with a nodular surface was found in a superior portion of the orbit. Posterior segment was normal. Ocular sonography (standardized echography, A- and B-scan) showed a thickening of the left superior rectus. Orbital computed tomography (CT) scan shows fullness in the superior portion of orbit due to a well-defined, hypo-dense, peripheral rim-enhancing lesion in relation to left superior rectus muscle closely abutting the globe without any intra-ocular extension. The sagittal reconstruction shows a ring-enhancing lesion in the superior rectus, suggestive of an abscess [Figure 2]. Blood culture was negative. Provisional diagnosis of superior rectus muscle abscess was made, and the patient was started on cefotaxime 500 mg 12 hourly and gentamicin 40 mg 8 hourly intravenously. On the 2 nd day, pus was drained through the skin approach. The swelling reduced on 2 nd postoperative day and the child was able to open his LE. Gram stain showed Gram-positive cocci and the culture grew S. aureus. He was discharged with gatifloxacin twice daily orally. After 1-month, he had residual restriction in motility in superior gaze [Figure 1]b. Of the seven reported cases, five were due to S. aureus and the two were idiopathic. S. aureus is responsible for 95% of the cases in tropical areas and 70% of the cases of pyomyositis in nontropical areas. The etiology of pyomyositis is uncertain. Given the lack of adjacent orbital inflammation in our cases, we suspect that recti muscles were possibly seeded through hematogenous spread. Although the clinical features are frequently suggestive of myositis, they are nonspecific, and noninvasive investigations such as orbital ultrasonography and CT or magnetic resonance imaging (MRI) scans are required for precise anatomical tissue localization and diagnosis. The role of ocular muscle biopsy is probably limited to atypical cases or those unresponsive to therapy, particularly to exclude neoplasia. Haufschild et al. reported an idiopathic isolated abscess of superior rectus muscle in an 11-year-old girl. MRI showed an abscess with central cavitation and a rim of enhancement. The patient was treated with intravenous antibiotics. Varma et al. reported two cases of young boys with EOM abscess on MRI. In both the patients, ultrasonography-guided aspiration was performed, and the patients were treated with antibiotics. The culture grew Staphylococcus in both of them. Acharya and Jethani  reported four cases of isolated EOM pyomyositis. CT scan of all patients showed a typical hypo-dense rim-enhancing lesion of the muscle involved. In all the above studies, patients were treated with intravenous antibiotics and drainage of pus. Main differential diagnoses in children are other inflammations and infections (e.g., diffuse orbital pseudotumor, orbital cellulitis), structural lesions (e.g., dermoid cyst), vascular neoplastic lesions (e.g., capillary hemangioma, lymphangioma), lymphoproliferative diseases (e.g., lymphocytic granuloma), neurogenic tumors (e.g., neuroblastoma, plexiform neurofibroma), mesenchymal tumors (e.g., rhabdomyosarcoma), and metastatic carcinoma. Differentiating features found in our patient suggestive of left superior rectus abscess were inability to open and swelling in LE, tender, palpable, ill-defined mass with a nodular surface in superior portion of orbit and orbital CT scan showing a well-defined, hypo-dense, peripheral rim-enhancing lesion in relation to left superior rectus muscle. It can be concluded that pyomyositis of EOM should be considered in any patient presenting with acute onset of orbital inflammation and characteristic CT or MRI features. After making the diagnosis, incision and drainage coupled with antibiotics eradicate the infection in most patients and the same happened in our patient. Scriba J. Beitrag zur aetiology of acute myositis. Dtsch Z Chir 1885;22:497-507. Haufschild T, Weber P, Nuttli I, Hecker B, Flammer J, Kaiser HJ. Idiopathic isolated abscess in an extraocular muscle in a child. Arch Ophthalmol 2004;122:1233-4. Varma A, Sharma K, Rathi B, Gupta RK, Malik V. Isolated abscess of extraocular muscle in two young boys: Clinical and imaging features. Orbit 2003;22:67-72. Acharya IG, Jethani J. Pyomyositis of extraocular muscle: Case series and review of the literature. Indian J Ophthalmol 2010;58:532-5. Shepherd JJ. Tropical myositis: Is it an entity and what is its cause? Lancet 1983;2:1240-2.